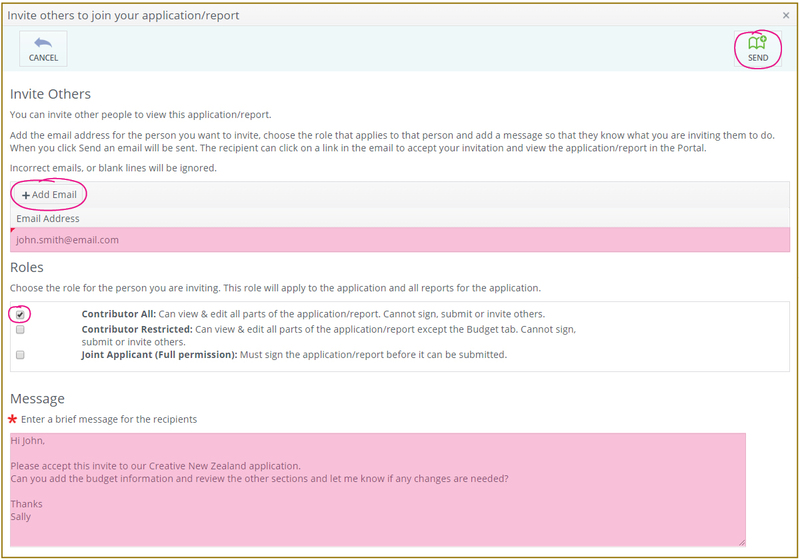 You can invite others to contribute to your application from the 'Applicant Details' tab or you can ask Creative New Zealand to add others for you. You can invite joint applicants (people or organisations will be jointly responsible for managing the grant) or someone you have asked to help edit or review the application. Select the 'Applicant Details' tab of your application form. Scroll down to view the 'Invite others to this application' section. Click '+Add Email' to enter the email address of those you want to invite to the application. Contributor All: Can view & edit all parts of the application/report. Cannot sign, submit or invite others. Contributor Restricted: Can view & edit all parts of the application/report except the Budget tab. Cannot sign, submit or invite others. Joint Applicant (Full permission): Must sign the application/report before it can be submitted. Type a brief message for the invitee so they know what they have been invited to do. The invitee will receive an email inviting them to join the application. The invitee will be asked to choose whether they are accepting as an individual, or on behalf of an organisation. When the invitee accepts your invitation they will move from the 'Invited' to 'Accepted' section on the 'Applicant Details' tab. You can click 'Revoke' 'Edit' or 'Delete' to change who has access to which parts of the invitation. If more than one person has the application open you will not be able to save any changes, so co-ordinate with those you have invited to your application. If you are making an application jointly with another individual or organisation all applicants need to sign the application before it can be submitted. If you are applying on behalf of an organisation, others who belong to the same organisation in the Portal do not automatically see the application. If they need to edit or review the application follow the steps above to invite them to join. You can share your application with others by clicking 'PRINT' in the top right-hand corner of the application form. This will create a PDF of your application that you can share by email or print.